Beware: WilbertPierce - "Artists Beware"
I made a thread in the deviantArt job offer forum on March 13th; I was looking for an artist who was adept at making 3D figurine models (I wanted to have a physical figurine of Six from Tripping the Rift). 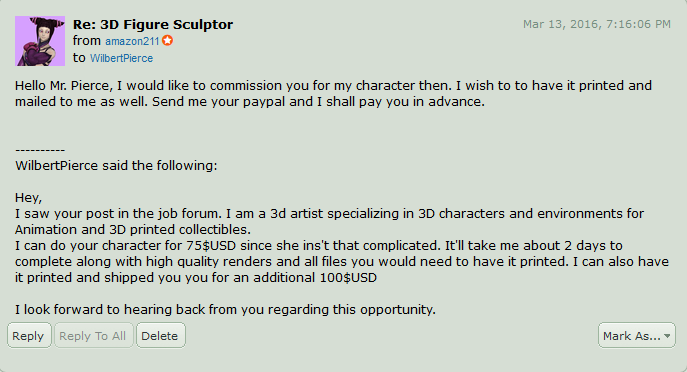 WilbertPierce responded by saying that he would make the model if I paid him $175 USD. I thought WP was trustworthy so I agreed to the price and paid him the total on that day, which is a decision that I regret. I know now that it was a foolhardy idea to pay the total amount to an artist, but I had a great deal of trust in the deviantArt artists who I commissioned before. I had never been scammed before this instance. When WP stopped communicating through dA notes, I tried to contact him via paypal and gmail, but he refused to reply back. In May, I set up a dispute case against him because he refused to communicate with me about the project. I did not know if he was working on the model or he just took my money and had no intention of giving me what I wanted because he seemed to be avoiding my messages. When I managed to get a response from him from gmail (he sent me preview pictures of the model), I decided to close my dispute case against him because I thought he was going to actually make and ship the commission. In hindsight, I feel like kicking myself for closing my dispute case too soon. He did not even ship me the product yet. After sending the pictures, Pierce made a promise to send me updated previews of his progress, but he never did. He kept claiming that he did send me the pictures, but since July, he has never sent them and delivered the model that I requested. Please do not buy or commission anything from him, he will con you of your money and never give you what you commissioned for. Hi there! We've approved this post, but would you mind putting a NSFW tag on the artist's gallery? Thanks! How do I do that? I'm new to livejournal. Click "edit entry". It will bring you to a new screen with your post. Just type NSFW next to the gallery url. :) Click save. I'm not sure if I did the tag right. Hmm looks like it broke the html. Try it again but this time type it in front of "where", and delete the _nsfw from the url so it can work again. So we need to label it NSFW even when it's a fav and not the gallery that's adult? We don't know how long the adult material, even as a fav is going to kick around on the page. It's better to be polite and give a heads up on adult stuff on the front page of something at the very least. 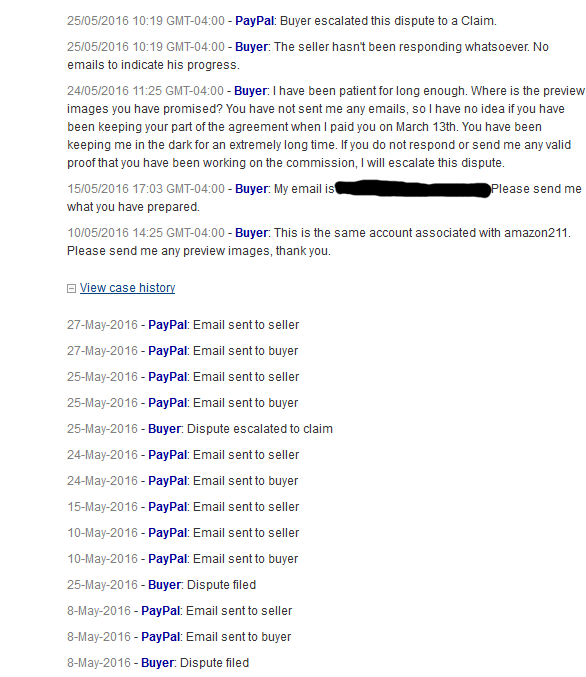 I'd give paypal a call, escalate to a supervisor if you have to, and get the case reopened considering he has not sent you any responses. Thank you for the advice. Since I had closed my paypal dispute, I am going to get my money back via my bank. My bank will send a notice to paypal to get the money back. I completely forgot you can do that, lol. Yea do that, good luck to you!!! I went through the process of contacting my bank and I am back to square one again. I can't get money back because it's too late to even dispute the payment through my bank. Damn it. Well aside from that being untrue, if you're out of the time range that's for all categories of a chargeback. Hense the question mark, but maybe OP could try calling Paypal again and explaining harder? Seconding this. If you ever find yourself in this position again, do not close your dispute until you have the product in your hands. Unfortunately, some people will make promises to convince you to close it without following through- then you're outta luck.